When we attend shows and fiber festivals, we almost always connect with a new maker who uses our products to create their wares. 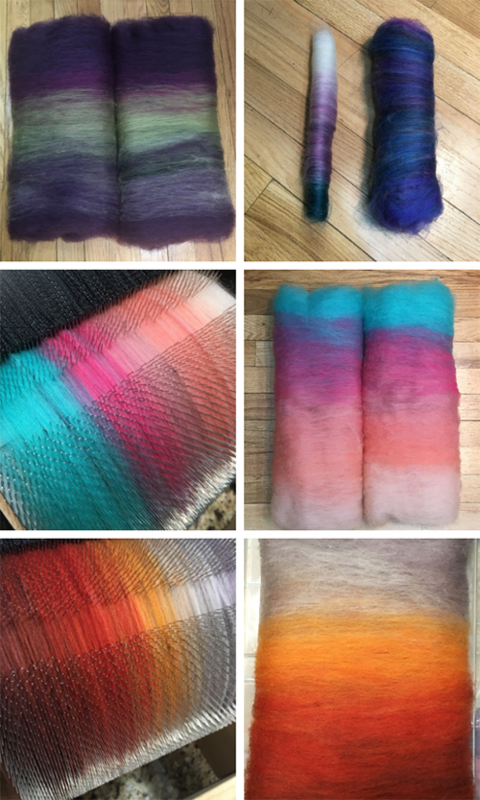 This month’s installment of Meet our Makers is a little different, however: we connected with Hopkins Fiber Studio over social media, where Emonie frequently shares photos of the gorgeous fibers she’s working with to create beautiful batts. We are so pleased to share Emonie’s fibery story with you today! 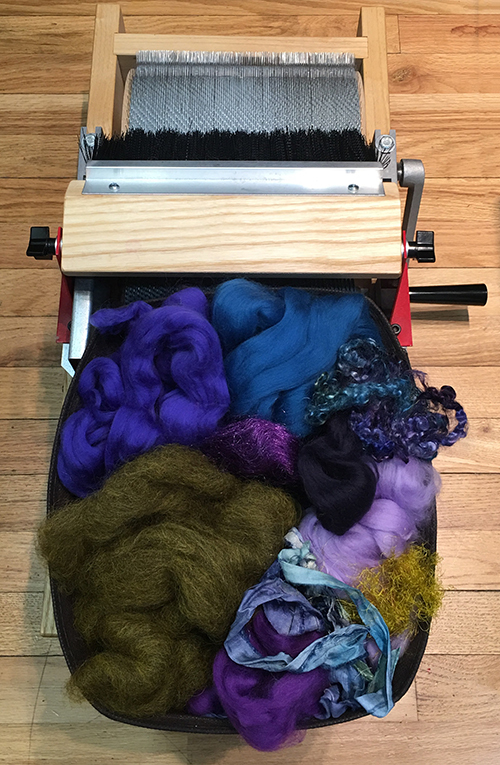 Emonie’s drum carder of choice is the Mad Batt’r, which she first tried using in the demo room at the SSK Retreat in June of 2017, along with the Petite. She says: “There was something different about this carder as I had 2 carders at home already but they didn’t seem to card like this! I said..oh! I remember thinking what is going on with this licker in! It’s magic! No adjustments out of the box, no fibers all congregating on the licker in …NOTHING just a smooth batt right off the bat (or batt)!” She went home from the retreat and purchased a Petite, and soon after graduated to the Mad Batt’r to create her bounteous batts and fluffy rolags. 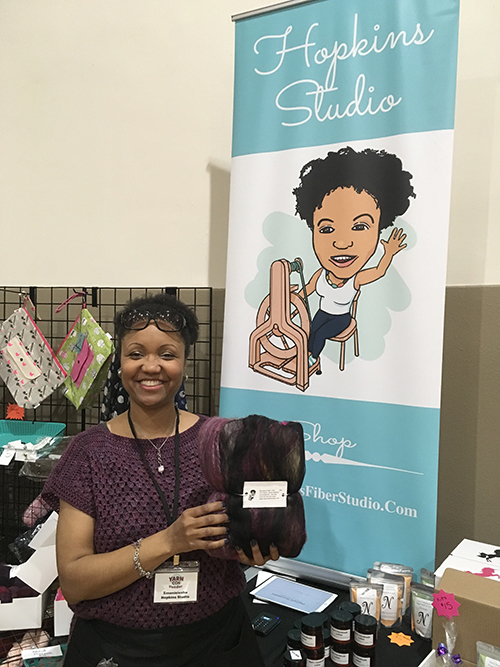 Although she originally started her business sewing handmade project bags, she’s been selling hand-dyed yarns, fibers and more at shows and in her online store since 2018. 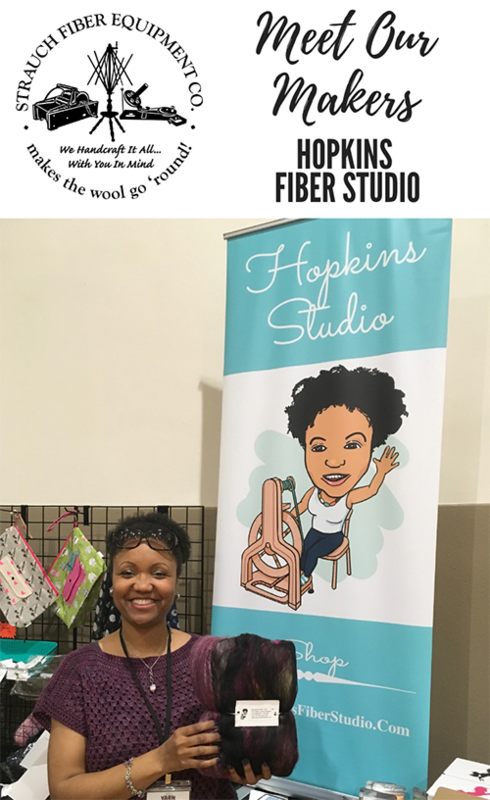 Most recently, Hopkins Fiber Studio was spotted at YarnCon, Chicago’s Indie Fiber Festival, and she plans to attend the Northern Illinois Sheep and Fiber Festival and the Berwyn Spring Spin In in June. Emonie tells us that she has always been a creative person, and while she also knows how to knit, crochet, and sew, spinning is the one thing she would do if she absolutely had to pick just one thing. Through spinning, she began to venture more into fiber prep and breed studies in her quest to make great hand spun yarns which will create gorgeous handknit and crocheted fabrics. You can follow her fiber adventures on Instagram as @HopkinsFiberStudio, on Ravelry as HopkinsStudio, or visit www.hopkinsfiberstudio.com. This entry was posted in Carding, Meet Our Makers and tagged drum carding, meet our makers. Bookmark the permalink.